It takes a lot of patience to make a loaf. Even if you use a stand mixer to do the kneading, like I did here (always a good option with a wet dough like this one, but kneading by hand will do the trick too) you’ll still have to wait at least an hour for the dough to rise (or 2 hours with doughs like this one) and then another hour for the loaf to prove after shaping, but I promise it’s worth it. This particular loaf is a great option if you’re trying to be vaguely healthy. (Is bread ever healthy? I suspect not but we love it anyway right? 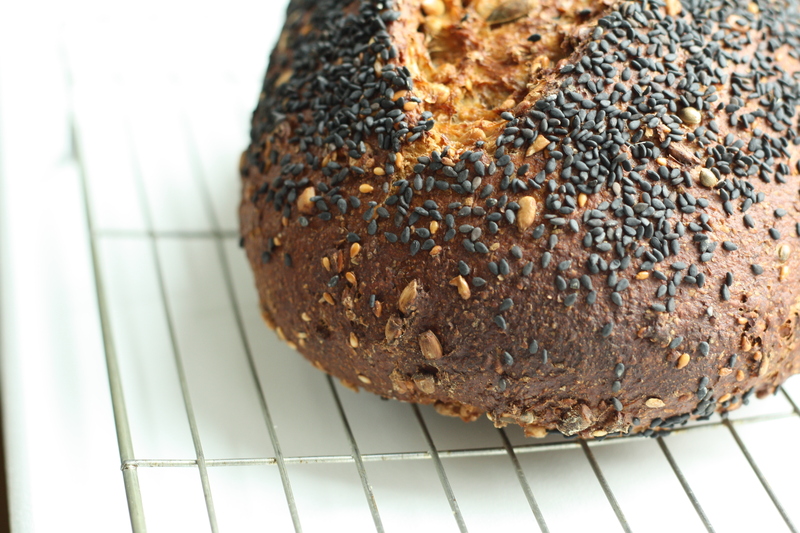 Mmmm carbs…) It’s completely chock-a-block with seeds and has a lovely crunchy crust with the added fabulousness of black sesame seeds. 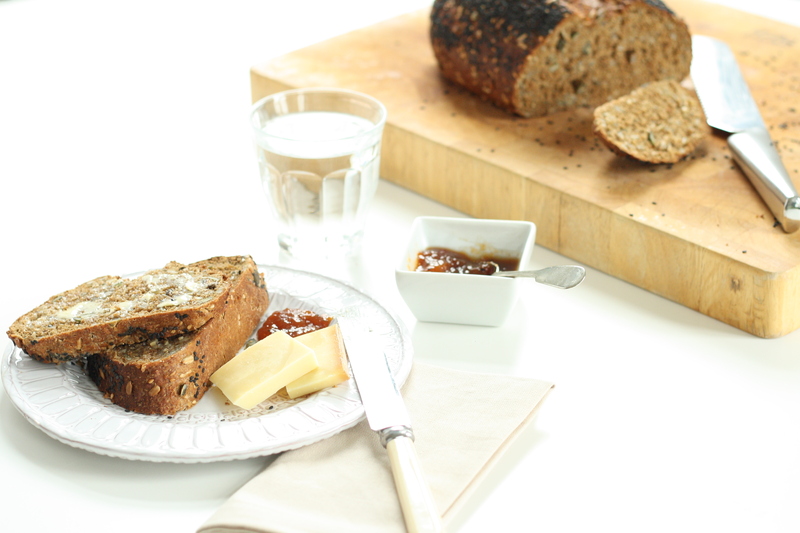 Another thing that makes this loaf a tad unusual is the addition of black treacle. I’m not entirely clear on what the treacle does here, I guess it must be adding a bitter back note, but whatever it’s doing, it’s working for me! This baking game can be tricky, there’s a slight chance that I may have over egged my oven temperature (and filled it with apparently unnecessary steam, because I was naughty and didn’t read the recipe!) leading to a slightly darker crust than I might have liked and slightly undercooked insides. I still scoffed the lot very happily but Paul Hollywood definitely wouldn’t have voted me star baker. I think I may need considerably more practice before entering the Great British Bake Off! 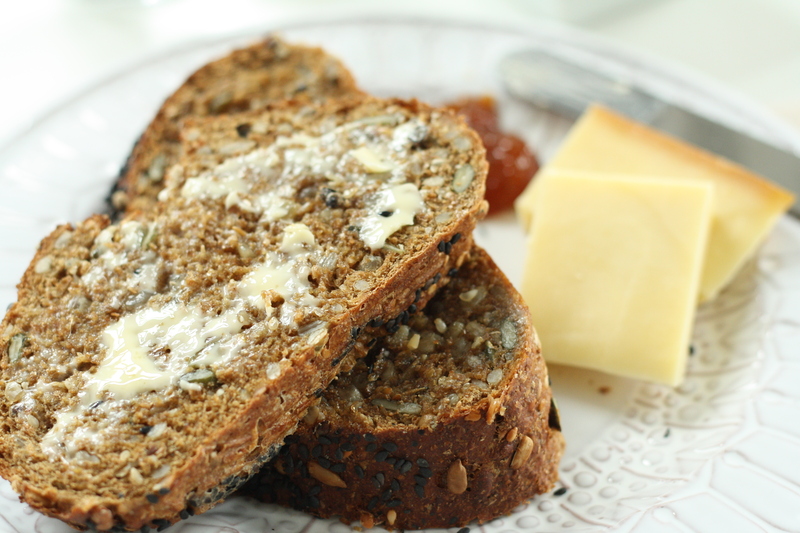 This loaf is fabulous with a little bit of your favourite cheese (purchased at a French Farmers’ Market of course!) and some chutney. It makes great toast and if you wanted to cut two insanely fat slices and whip up an incredible doorstep sandwich, you would be well on your way to becoming one of my favourite people. One thing I must warn you about, if you make this loaf, you will find sesame seeds all over your kitchen and just when you think you’ve swept them all up, a couple of cheeky ones will appear in the corner of the work surface. Put both of the flours into the bowl of a stand mixer with a dough hook fitted. Add the salt to one side of the bowl and the yeast to the other side, then add the treacle. Pour in 3/4 of the water, lower the dough hook and start mixing at a slow speed. As the dough starts to come together, slowly add the rest of the water, raise the speed to medium and leave the mixer to do its thing for 7 minutes. Turn off the mixer, add the mixed seeds (but not the sesame seeds) to the dough and start mixing again at a slow speed for 2 minutes. You may have to squash the last few seeds into the dough by hand. Turn off the mixer, take out the hook, cover the dough with a tea towel and leave it for 2 hours to rise to twice its size. In the meantime, line a baking tray with parchment paper. Move the loaf to the baking sheet, brush it with a little warm water and sprinkle it with sesame seeds. Slash the length of the loaf with a sharp knife. Put the tray into a clean plastic bag and leave the loaf to prove for an hour, until it has doubled in size. In the meantime preheat the oven to 230 C / 210 C Fan / 450 F.
Once the dough has proved, bake the loaf for 30 minutes until it sounds hollow when you tap the base. 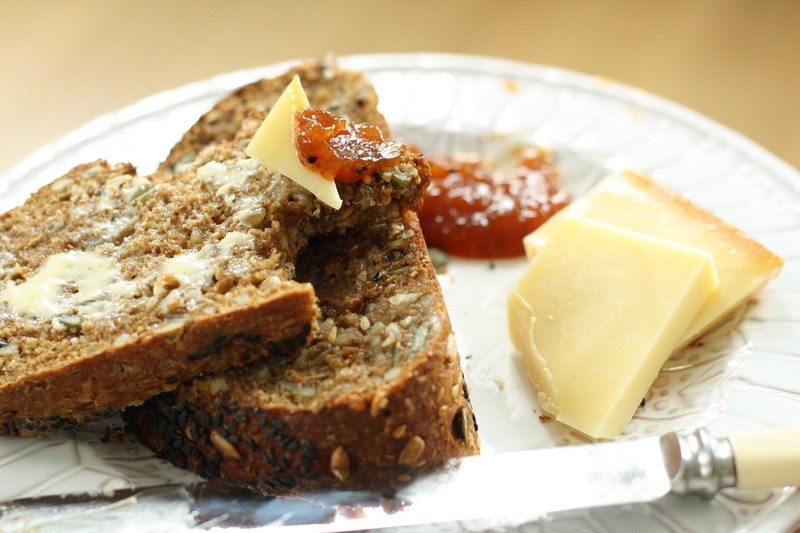 Leave it to cool on a wire rack and then pile on the cheese and chutney!